I’ve only played a little so far, and I hope to do more over the weekend. 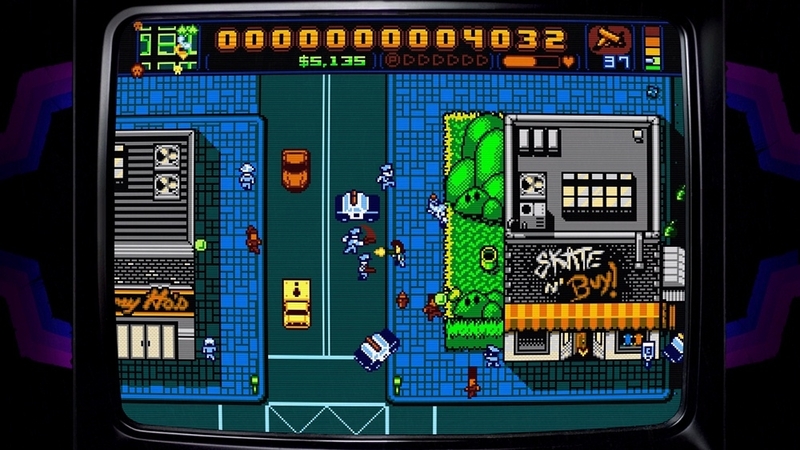 So far, Retro City Rampage is an awesome trip down memory lane. There are a ton of “in-jokes” that players not over the age of 25 just won’t get, unless they’ve done their homework. I bought the game without even downloading the demo, because I wanted to support the developer of this one. But my rose tinted glasses are already starting to let in a harsh reality that I may have jumped too soon. The plot, so far, anyway, is vague and muddled. Not in a classic 1980’s “PRESS START AND GO RIGHT” sort of way, but in a “we’re so busy trying to cram references you’ll get down your throat, that we’re going to make sure none of them make sense.” You want nothing more than to go on a rampage… because you’re an antihero… who obeys every word his mob boss says… and suddenly finds a time machine. Which, based on the screenshots I’ve seen, is going to take me to other levels that play like other games from the past. Alright, I’m clearly into retro, but some things get taken too far. References are great, but when literally every line has more to do with a joke than helping me understand what I’m supposed to be doing you’re trying too hard. Make the game enjoyable, don’t just slap me in the face with YOU REMEMBER WHEN THIS WAS COOL, DON’CHA? I’m hoping that maybe I’m still in a bit of a tutorial phase and the game will slow down, but so far the mechanics change, the plot seems extremely restrictive, and the game went from “Retro” and “Nostalgic” to something akin to the Home Shopping Network trying to get you to buy a Chia Pet.